2 How often do you…? Meaning I eat breakfast every day. Sun. Mon. Tue. Wed. Thu. Fri. Sat. v I always eat breakfast. Susan gets up early six times a week. Sun. Mon. Tue. Wed. Thu. Fri. Sat. v v She usually gets up early. Kim goes to bed late five times a week. Sun. Mon. Tue. Wed. Thu. Fri. Sat. v He often goes to bed late. Maria and Bill walk to school three times a week. Sun. Mon. Tue. Wed. Thu. Fri. Sat. v They sometimes walk to school. Mike does his homework once a week. Sun. Mon. Tue. Wed. Thu. Fri. Sat. v He rarely does his homework. Jenny doesn’t drink coffee. Sun. Mon. Tue. Wed. Thu. Fri. Sat. She never drinks coffee. 6 How often do you…? Correct? Position: Where do these frequency words go? Correct? Can you guess? (X) 1. I watch often TV. often I _______ watch TV. 2. Mr. Lee plays sometimes tennis. (X) sometimes Mr. Lee ___________ plays tennis. 3. Alice reads rarely books. (X) rarely Alice ________ reads books. How often do you…? Position: Where do these frequency words go? Let’s look at the examples at the beginning again… l I always eat breakfast. l She usually gets up early. l He often goes to bed late. l They sometimes play tennis. l He rarely does his homework. l She never drinks coffee. 8 Yes, they usually come between the subject and the verb. How often do you…? Position: Where do these frequency words go? Yes, they usually come between the subject and the verb. Here are the rules! 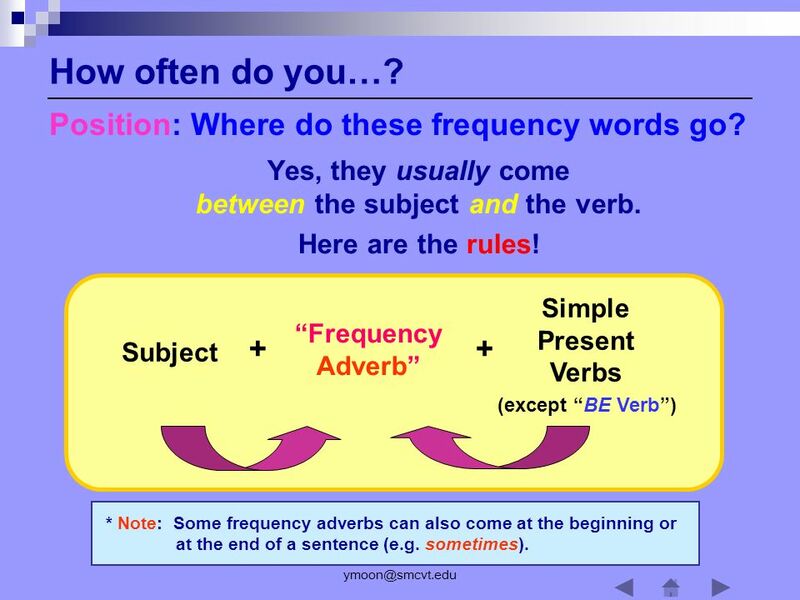 Simple Present Verbs “Frequency Adverb” + + Subject (except “BE Verb”) * Note: Some frequency adverbs can also come at the beginning or at the end of a sentence (e.g. sometimes). 10 Then, let’s try to put the words in order to make sentences. How often do you…? 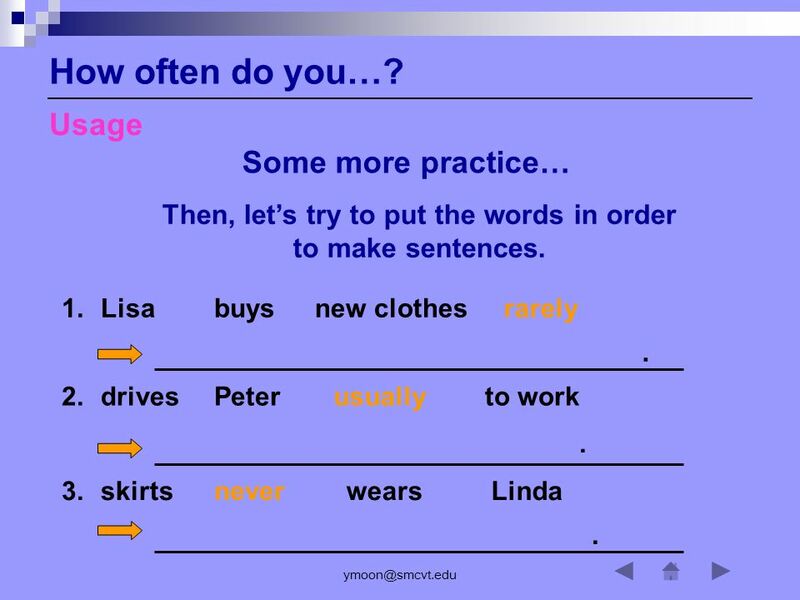 Usage Some more practice… Then, let’s try to put the words in order to make sentences. 1. Lisa buys new clothes rarely . 2. drives Peter usually to work . 3. skirts never wears Linda . 11 How often do you…? Usage Now, tell me about you! 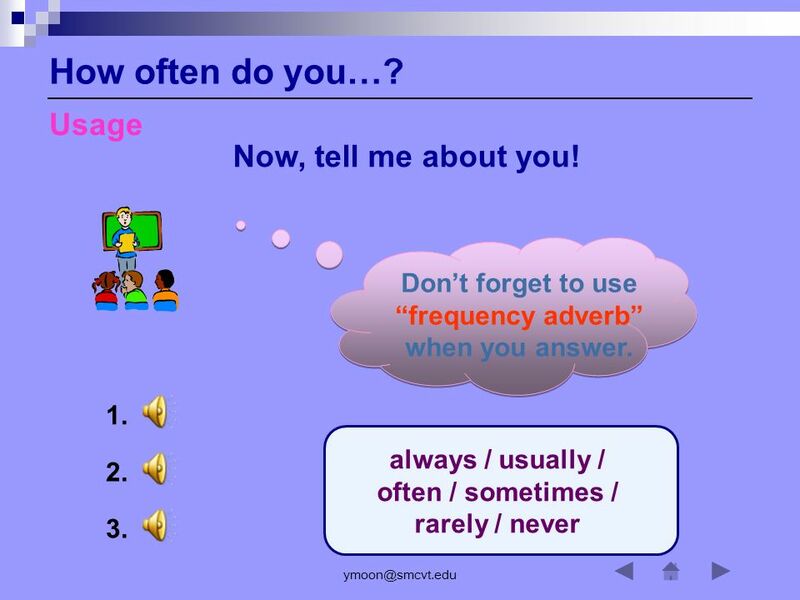 Don’t forget to use “frequency adverb” when you answer. 1. always / usually / often / sometimes / rarely / never 2. 3. 13 How often do you…? Any Questions? 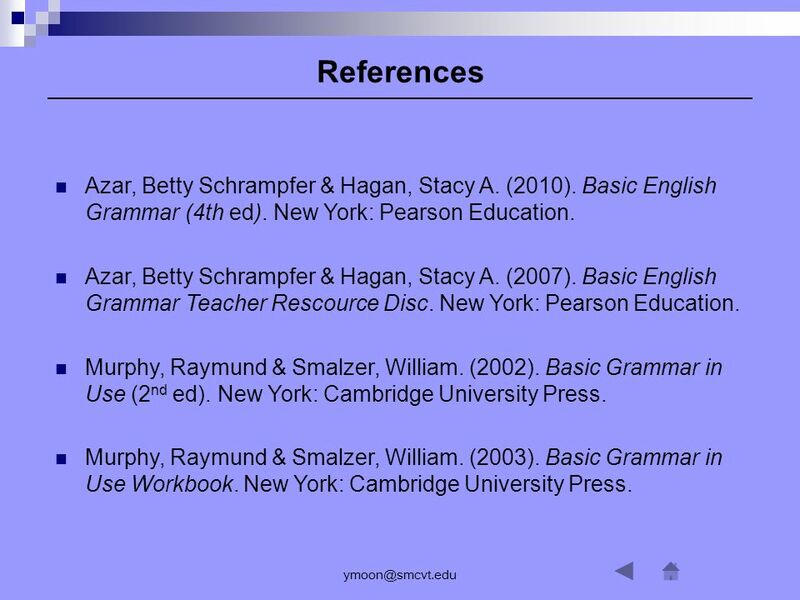 14 References Azar, Betty Schrampfer & Hagan, Stacy A. (2010). Basic English Grammar (4th ed). New York: Pearson Education. Azar, Betty Schrampfer & Hagan, Stacy A. (2007). Basic English Grammar Teacher Rescource Disc. New York: Pearson Education. Murphy, Raymund & Smalzer, William. (2002). Basic Grammar in Use (2nd ed). New York: Cambridge University Press. Murphy, Raymund & Smalzer, William. (2003). Basic Grammar in Use Workbook. New York: Cambridge University Press. 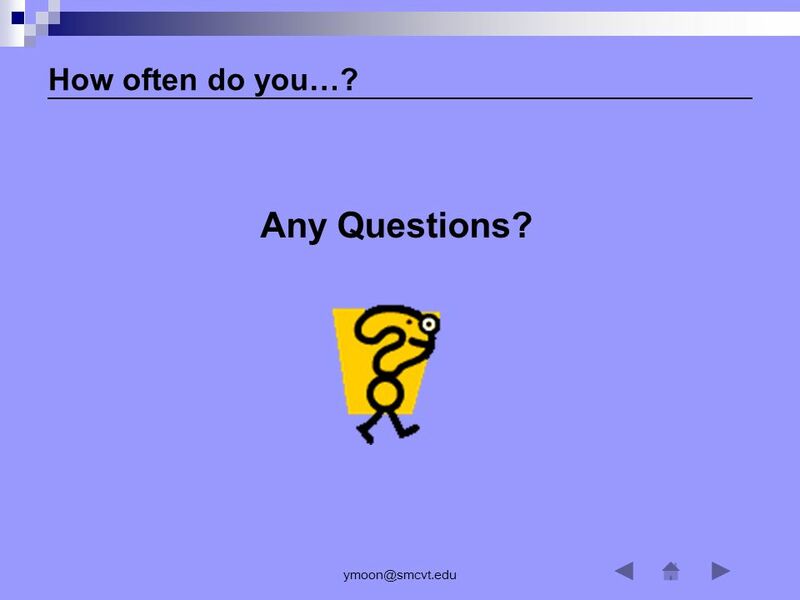 Download ppt "How often do you … ? 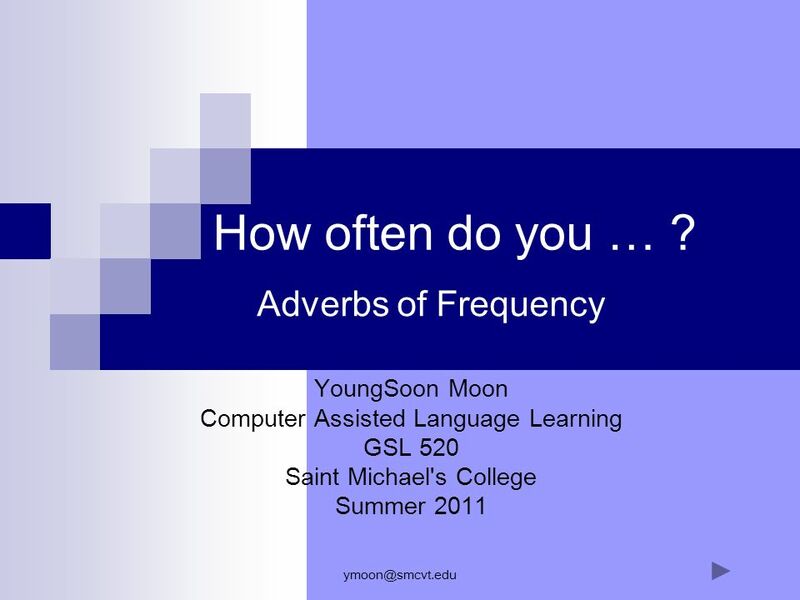 Adverbs of Frequency YoungSoon Moon"
Unit 5 Topic 1 How do you usually come to school? How do you usually come to school? 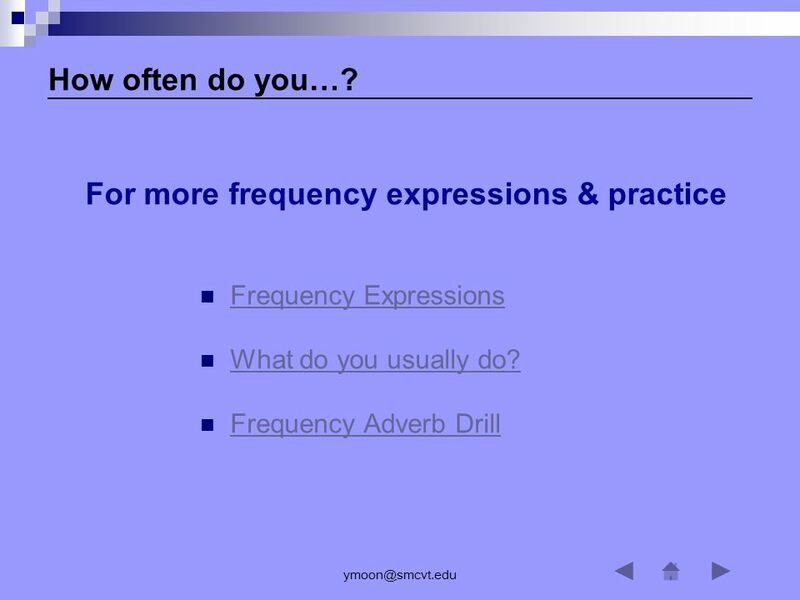 Unit 2 Our daily life Reading A.
Adverbs of Frequency CEP 811 Jinny Kim Han Let’s begin! How often do you …? How often are you …? 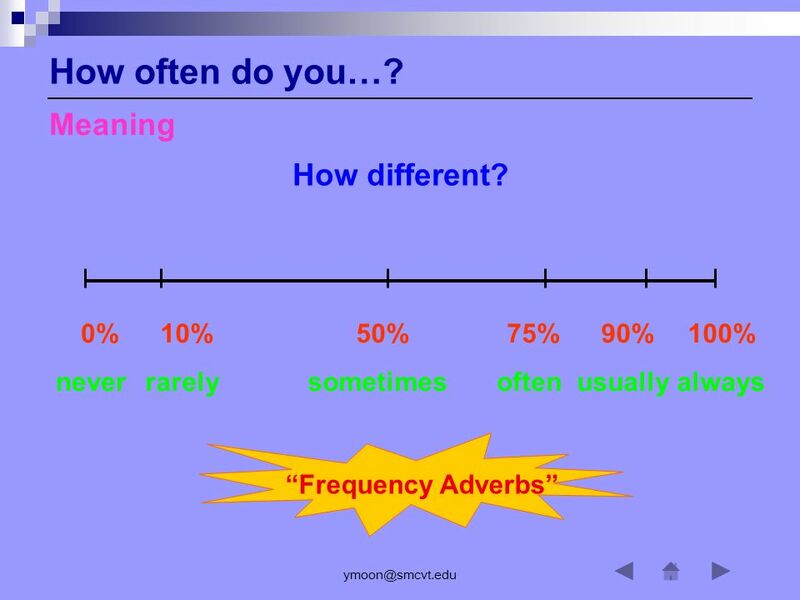 Adverbs of Frequency Kristi Reyes. EMPHATIC ADVERBS OR ADVERBS OF FREQUENCY They are words that indicate the frequency with which an action occurs. Always100% of the time often75% of the. Parts of Speech Part 2: Adverbs and Prepositions. alwaysusuallyoften sometimes / occasionallyrarelynever 0%50%100% hardly ever 항상전혀보통자주가끔별로거의 Grammar Target The adverb ( 부사 ) you use tell how often. Forming yes/ no questions I am a student. () He is a lawyer. ( ) She is a teacher. ( ) It is a thunder. ( ) They are doctors. () We are Saudis. ( ) Mike. USES OF THE PRESENT SIMPLE Giraffes eat vegetables. Cheetahs run very fast. Dolphins don’t live in the river. Simple Present Tense Practice. Present Simple Sentences - Affirmative 1 David / hate / alcohol 2 my / play / brothers / basketball 3 teacher / my / like.